The EPA keeps delaying enforcement of its formaldehyde rule, so we're taking the agency to court. FEMA housed Hurricane Katrina victim Martha Hentor, 82, in this trailer in Gulfport, Mississippi. 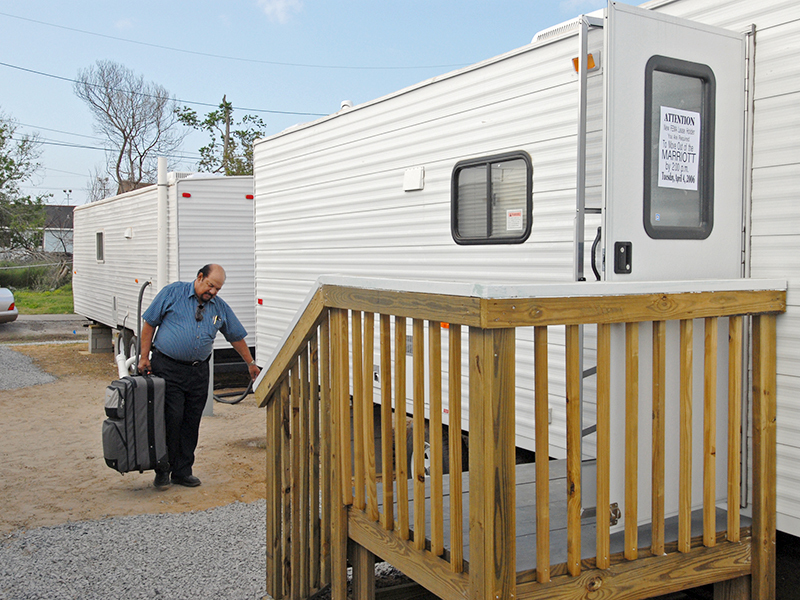 Some of the trailers FEMA provided to hurricane refugees emitted toxic levels of formaldehyde, a cancer-causing chemical. Update, 2/16/2018: Today, a federal judge in Oakland, California, ruled that the EPA illegally delayed its enforcement of formaldehyde restrictions in wood products. Judge Jeffrey White ordered the agency to implement the standard. Today was supposed to be a milestone. It would have marked a victory for public health and peace of mind for people who’ve been sickened by formaldehyde, a known carcinogen that is nevertheless used in many wood adhesives. December 12, 2017, is the date an EPA standard was set to go into effect governing how much formaldehyde wood products can emit. Congress passed a law in 2010 requiring the EPA to adopt California’s tough emission standards for composite wood products. Instead, today is just another day. And this chemical is still being used to make items from inexpensive flooring and furniture to kitchen cabinets and recreational vehicles. Earthjustice is challenging the EPA’s latest delay in court, on behalf of the Louisiana-based group A Community Voice as well as the Sierra Club. We’ve seen a pattern of the EPA under Administrator Scott Pruitt abdicating its responsibility to enforce public health and environment protections, opting instead to extend compliance deadlines. With the formaldehyde rule alone, the agency has announced numerous extensions, first to March 21 of this year, then to May 22. In September, the agency tacked on another full year, to Dec. 12, 2018, for manufacturers and importers to comply. This lack of urgency has come at a cost to people’s health. Among those who have suffered from unregulated formaldehyde use are families who found themselves in travel trailers and mobile homes supplied by the Federal Emergency Management Agency after disasters like Hurricanes Katrina and Rita. “Right away, we observed strong chemical odors were present in the trailer,” said Jesse Fineran, who went to work for FEMA in 2005, after losing his home in Bay St. Louis, Miss., to Hurricane Katrina. He describes experiencing irregular heartbeats and shortness of breath, and acquiring a lasting sensitivity to chemical odors and formaldehyde-based products or resins. Ongoing sensitivity to formaldehyde is one of the common side effects of exposure. And Fineran’s son Joseph died at 39 of heart failure, just a few years after moving out of a toxic FEMA trailer—the second one the agency had housed him in. FEMA replaced Joseph’s first formaldehyde-contaminated trailer with one that proved to have even higher levels of formaldehyde. The Finerans’ story is one of many. Isn’t it time for the EPA to do its job? We think so. And here’s another date to watch: January 12, 2018. That’s when the U.S. District Court for the Northern District of California will hear our arguments. Patti is a managing attorney of the Northwest regional office in Seattle, where she works to fight efforts to turn the Pacific Northwest into a fossil fuel export hub. She also leads Earthjustice's pesticide work and efforts to preserve access to the courts and legal remedies. Her litigation experience includes notable successes in safeguarding the region’s old-growth forests, restoring Pacific salmon, and more.